Lisa of A Mermaid's Crafts, with her Shabby Garden entry. Lisa, please email Kim at info@emeraldcreek.org for your prize code. 2. Rijacki ofRijacki's Worshop for Score! 3. Karla of Creative Love Affair for Vacations! to receive a badge to post on your blog. stay tune for the fall line up of month long challenges! 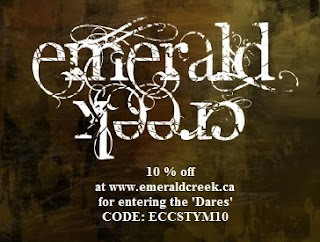 you get 10% off your order from the Emerald Creek Shop. So what are you waiting for... come join in the Sweet Fades Challenge... we DARE you! As of today, this is my last year in my 30's. Instead of being depressed or fretting, I decided I wanted to challenge myself to just love the journey. I am actually excited to be crossing 40 (today anyway). To mark the event, I decided to post 40 entries over the course of the year, embracing all that I am doing, so I can be thrilled, feel accomplished, and just simply enjoy my 40th Birthday. I have so many projects and posts on-the-go in preparation for this. We will still have contests and monthly challenges starting with September as part of the 40 posts; however, there will also be posts on our Trade Shows, holidays, family moments, and celebrations. I will also share some tips on business, camping (of course), and whatever else this crazy brain of mine decides. So join me on the journey this year as I welcome the days until my 40th birthday! "The Biker" for my Nephew. I stamped the Sand Dunes and the Biker in Archival Ink. Then, I used the Rectangle Mirror Stamp to drop in some paint. After dabbing the colours, I misted the paint blobs. This one was over saturated with water. Whoops! This was the paint direct to dry paper. It didn't move enough to simulate the spray paint tagging effect I was going for. This was PERFECT! A mist of water to the paper first & then I pressed the paint dabbed rubber directly to the cardstock. The wet paper helped the paint blend. Next, I spray the Tim Holtz Corrugated Texture Cardstock. 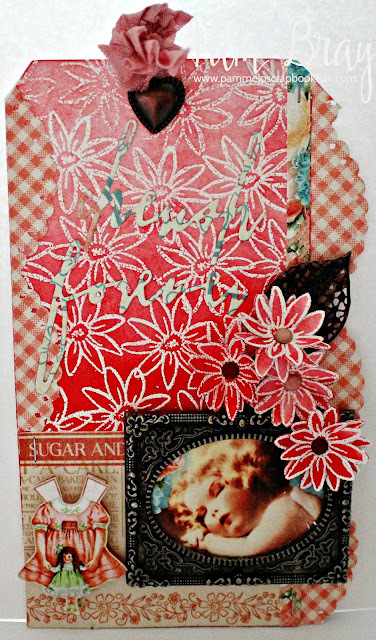 Once dry, I roughed it up with Tim Holtz sandpaper. 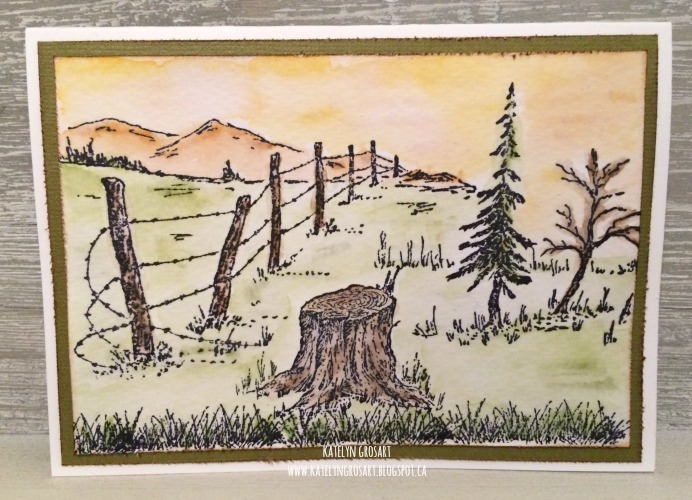 I washed the background with Tumbled Glass Distress Ink and my waterbrush. Then, I stamped Walnut Stain and Pumice Stone on my Craft Mat and lifted the colour with my waterbrush and painted the Sand Dunes. Evergreen Bough, Black Soot, Festive Berries, & Hickory Smoke Distress Markers were used directly on the Biker to colour him in. To finish off the card, I used the Happy Birthday Stamp with Mercury Rising Embossing powder. Thanks for the warm welcome, crafting fun, and collaborations. During my summer work and holiday schedules, I was only too excited to cram in all 3 sets of Creative Chemistry by Tim Holtz, (offered at Online Card Classes). But I had NO IDEA his classes would have so much technique and test samples, that I would be spread so thin. So in Creative Chemistry 103, I decided I needed to find a way to double up the class assignments with projects I also needed to be making. I pulled out some Emerald Creek stamps, a couple of Sizzix dies, and added them to the bunch of Ranger Inks, Mediums (most were from the Tim Holtz Distress line, with a couple of Wendy Vecchi, Ranger, and Dina Wakley items tossed in) and tools that were already sprawled across my work tables. I have been dying for a year now to make the Tim Holtz Umbrella Man a chimney sweep for a Mary Poppins inspired card for my sister. So, I set to work. I die cut him out on several types of Recollections coloured cardstock that I had purchased from Michaels (not my favorite for many projects but works well for matting borders, using for the kid's crafting, but perfect and affordable for playing with ideas and layering with paste). Next, I popped open the new Grit Paste and went to town pasting the negatives from cut out Umbrella Man. Loving it, wow that's a wet product and took a while to dry. 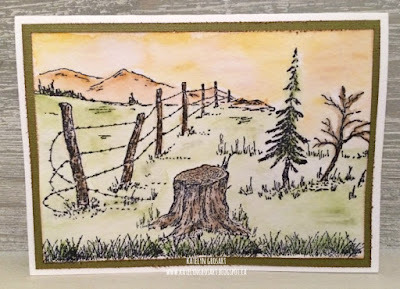 While it was drying, I used Blueprint Sketch paint on my craft mat, with some Lucky Clover Distress Ink re-inker and Fired Brick Distress ink placed on the mat too. Then, I grabbed the spritzer bottle and misted. Next, I grabbed my background piece and began dragging and blotting it on the messy craft mat. To build up layers, I dried that layer and repeated the process. To finish it off, I hit it with a couple spritzes of Wendy Vecchi Cornflower Mica spray. The effect was wonderful; however, when I layered it up, I felt the background needed more pop so I added Pearl and Viola Mica sprays and then it was perfect. Now that the paste for the top piece was dry, I went to work using Cracked Pistachio and Forest Moss stains to ink right on the paste and blending to smudge it around, while lifting off the excess. Then, I added a touch of Blueprint Sketch stain and Wilted Violets around the edge to bring the focus to the image. But it was still not quite right. So I left it to go ponder and decide just what saying I wanted to use before I trimed the umbrella. Google here I come...I typed in 'words to chim chimney' and up came some Mary Poppins images, so I switched and searched 'popular Mary Poppins images', and the quote 'to everything that must be done, there is an element of fun' popped up right away as well as loads of Mary Poppins silhouettes. Well, that couldn't be more perfect for me to give my sister for her birthday! So bye-bye Bert, Hello Mary! Instead of cutting the umbrella into a chimney sweep, I sketched the shoes, bag; and dress on my already-mostly-finished project, grabbed my scissors, and cut. Then, I ran through several markers attempting to write the phrase at the bottom. The only one that worked for this was the Tombow Black using the fine side. When I was done layering it, it was close but not quite "dirty" enough for old England. Also, the background was just too even, so I grabbed my spray bottle and misted the whole project. Then, I used my fingernail to scrape the edges of the silhouette image, re-inked lighter areas, and used a dry paper towel to create a more mottled look by blotting up the water in a slight twist/push moment that moved the mica powders. Oh... DARN..., I has to grab the Tombow again and rewrite the bottom. Next time, I think I will test out some Sharpies since they are permanent (wink, wink... Ranger and Tim). Have fun and don't miss out on these classes the next time they are offered. They are absolutely worth every penny paid. Just REMEMBER, they take time. Each lesson day had several techniques and tags, each one took me at least an hour of practicing and creating, and I have yet to polish up and complete pieces to post. We want to feature speedy Ombre techniques! With this awesome line-up, so let's not waste time. 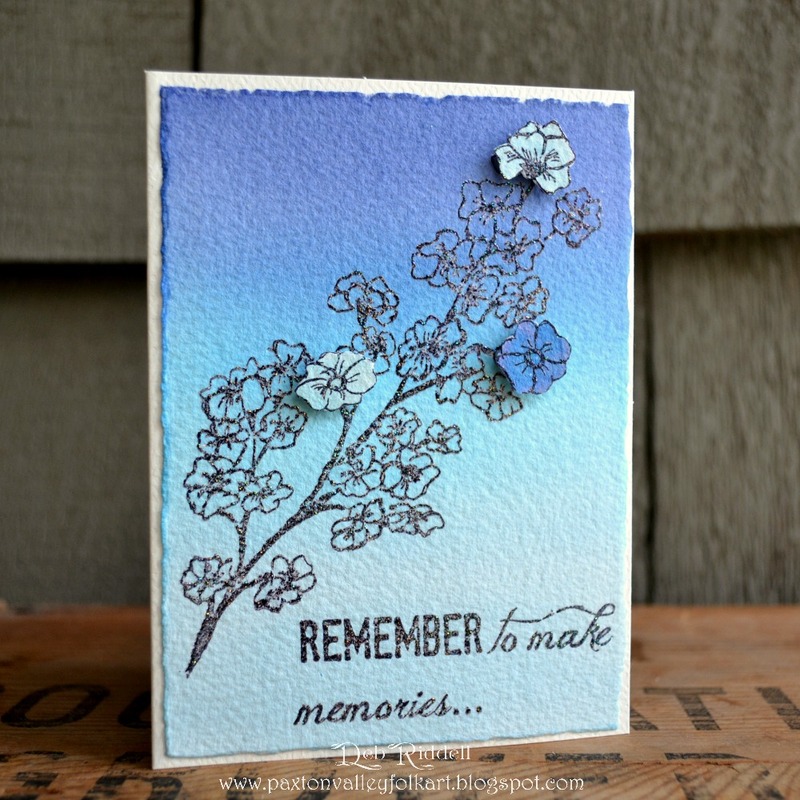 Up first is Deb and her cool blues, featuring the Fallen Blossom by Nicole Wright Designs. Speedy crafting is definitely not my forte so it was a real challenge for me to make this ten minute ombre birthday card! 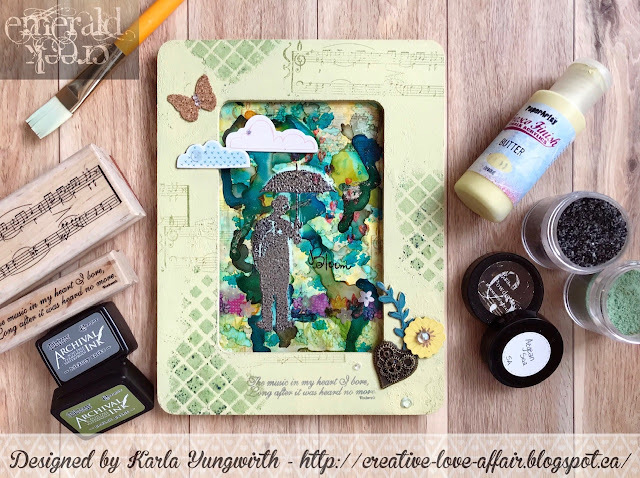 But Nicole Wright's Fallen Blossom stamps and Emerald Creek's Iridescent Shimmer embossing powder came to my rescue and I have to say it's pretty amazing what you can make in ten minute when you have to! I've a few (quick!) step by step photos on my blog, hope you can pop by to take a look. WOW!!! The DARE Challenge is to create a 10 minute project!!! Difficult for me but I all I can say is I sure did try. have your supplies gathered up and go for it. It was super easy to achieve the look I wanted for my tag using Emerald Creek Supplies Daisy Flowers and Glacier White Embossing Powder along with distress ink. It took me a few extra minutes to create the flowers from the scraps of embossed paper since I fussy cut them out and layered them together. I have step out photos on my blog. It's all about quick crafting and creating an ombre effect for our Emerald Creek Dares. So with those two things in mind and with the help of some of the amazing scene stamps available in the store as well as some water colouring, it made for an easy card. Head over to my blog for a step-by-step on how I created my card as well as a bonus card at the bottom of the post. Blast from The Past Dare with her Blast From the Past . Ellie please email Kim at info@emeraldcreek.ca for your prize code.